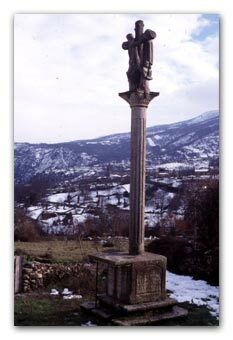 Attention: lovers of Romanesque art please also see our new project "Get lost in the Ribeira Sacra - POIs for GPS". The term "Ribeira Sacra" means the holy river side. It is more of a historic than geographic area. "The Ribeira Sacra" extends from the north of the province of Ourense and the south of the province of Lugo all along the banks of the river Sil from Quiroga to Os Peares and from the latter northerly, along the river Miño up to Portomarín which is one of the "stations" of the pilgrimage route to Santiago de Compostela. The term "Ribeira Sacra" has its origins in the numerous monas-teries, hermitages and abbies founded from the 6th century onwards in this region. The first time the term "Riboira Sacrata" was mentioned was in the year 1124 on a document signed in the Gallician town of Allariz, sent by the Queen María Teresa of Portugal to the monastery of Santa María of Montederramo. In addition to the monastery of Montederramo, those of San Esteban de Ribas de Sil, Santa Cristina de Ribas de Sil, Santa María de Xunqueira de Espadañedo and the heremitage of San Pedro de Rocas also constitute the Ribeira Sacra. All are situated in the province of Ourense. Across into Lugo province the monasteries of San Esteban de Ribas de Miño, San Vicente de Pombeiro and Ferreira de Pantón are also well worth a visit. 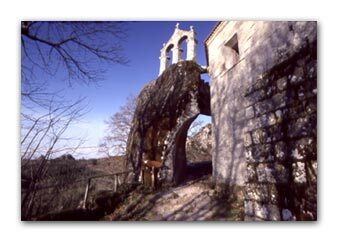 These monasteries reached their religious and spiritual peak betweeen the X and the XIII century and were completely abandoned in 1835 due to Mendizabal's confiscation in which the monks were expelled and the Church's properties were sold. Today these monasteries are undergoing a process of restoration. Since 1923 they have formed a substantial part of Spain's official artistic heritage.